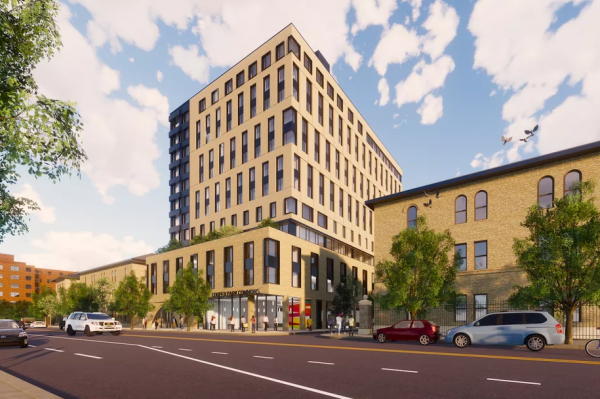 Soon moving forward is a long-postponed conversion of Greenpoint Hospital at 288 Jackson Street into a multi-building affordable housing complex designed by our friends at Architecture Outfit and Magnusson Architecture and Planning. The project will bring to Greenpoint 512 affordable apartments spread out across the 4-building campus, and will be divided into two phases: Phase I, relocating a 200-bed shelter to another building on the southern end of the campus; Phase II: conversion of the main hospital building into a 109-unit senior home. A boiler building will be demolished and replaced by a 136-unit residential unit. Apartments will be made available to “extremely-low”, “very-low” and “low-income households”; additionally, 30% of the units will be transitional housing for the formerly homeless. To the campus will also be added 21.5,K SqFt of community facilities including a workforce development center.